Licensed College Jewelry!! Lead & Nickel Free Sterling Silver Plated Key Chain Displays The Texas A&M University "Aggies" Logo. 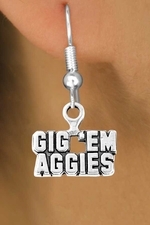 Scroll Down For More Texas A&M University "Aggies" Jewelry: W12796N, W12797E, W12798B, W12799N, W12800E, W12801B, W13404SG, W13449N, W13450SG, W13451N, W13848KC, & W13849KC!